December is here! I have my Christmas books out, Christmas music blasting and I can’t stop pinning Christmas cookies on Pinterest. Toddlers can be a lot of work, but nothing really beats having a toddler around Christmas time. Everything is all new and exciting to them! He couldn’t care less about what gifts he receives. He is more into making eating cookies, meeting Santa and checking out all the beautiful lights. So I thought I’d take advantage of the season and make some colorful, holiday-themed, educational games. W isn’t in preschool yet, but as a former Kindergarten teacher, I can’t help but share some alphabet games with him. 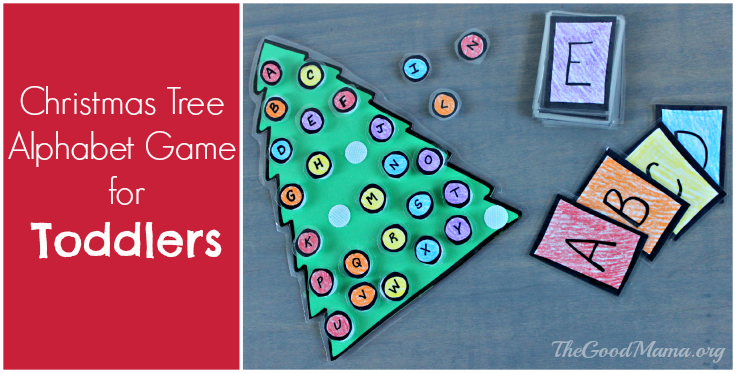 This Christmas Tree Alphabet Game is super easy to make and a lot of fun. If your toddler isn’t quite familiar with his letters yet, he can work on matching the colors instead. This is the perfect, quiet, portable game you can take on the road or to family holiday parties to keep your toddler busy and entertained. I made this game similar to my Thanksgiving Turkey Game. I just made the game pieces, cut them out and laminated them. Then I used velcro tape to stick the pieces together. My super smart friend doesn’t have a laminator, so she decided to make her turkey game out of felt. You could easily do the same thing here and then use a fabric marker to write on the letters. You could also turn this game into a one time craft. Simply print out the free printable, cut out the pieces and have your toddler glue the pieces on the tree. I know some toddlers are really into the glue sticks! Wow! This is awesome! Actually, my hubby is sitting right next to me and said, “Cute!” Super creative and fun. Now I need to find the time to make one! I think my daughter would love it! This is SUPER clever! Nice job, will you make me one?